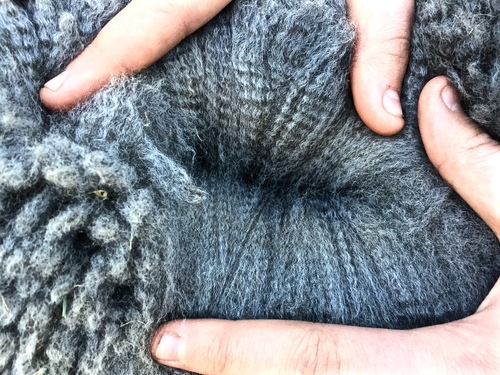 Bisturi is a stunning gray male with a gorgeous evenly colored fleece. 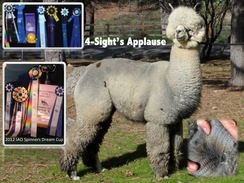 He has a fabulous pedigree that yields itself to producing not only gray, but quality fleece in general. An added benefit to Bisturi is that he is unrelated to any of the currently popular gray genetics out there. Reserve your breeding today to this fabulous gray male! Masquerada is the "grand dam" of our gray breeding program. We purchased her from Heatherbrook Farm in 2008 and have not regretted that one bit. She is strong, straight and squarely proportioned with a very proud presence. 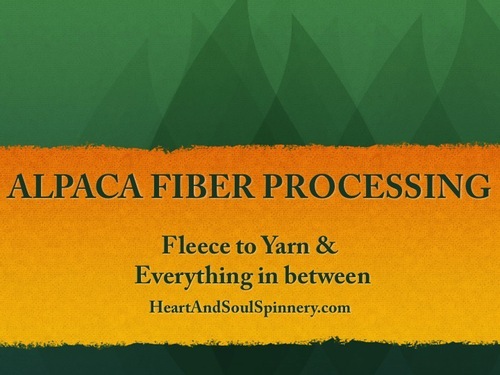 Her fiber is a bright, beautiful dark silver grey that gleams in the light. She has consistent character, excellent density and a soft, fine hand. 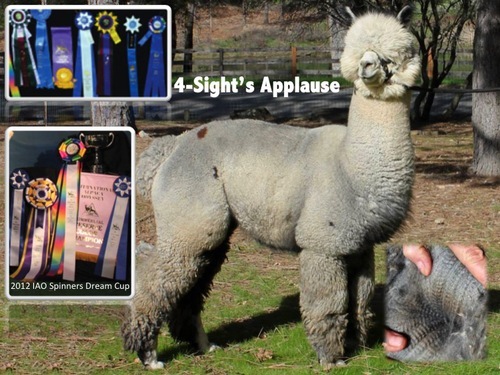 She is the total package and her results in the show ring, including her two championships, confirm that fact. KNOCK-OUT CRIA ON THE GROUND! The day Applause was born, we were wowed! It was the first time we didn't say, "If he only had a little more this" or "a little more that." Applause was born a knock-out and he has not disappointed us. 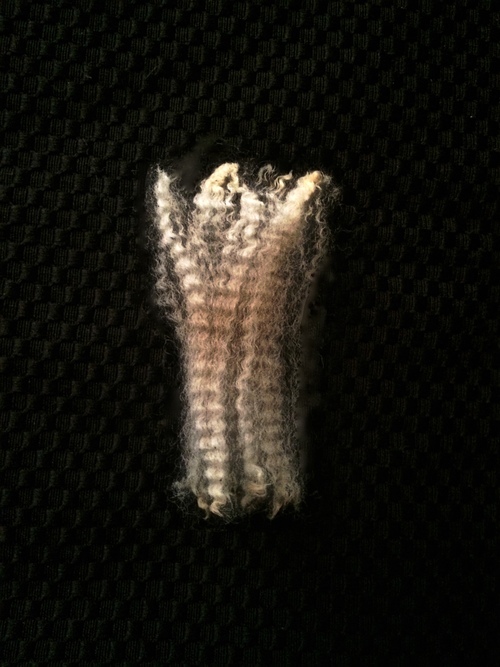 He has an incredible soft handle and loads of crimpy-to-the-end, dense fleece. 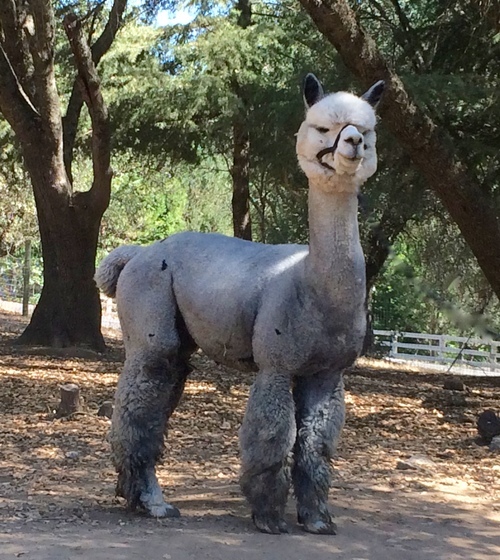 Out of our foundation dam Heatherbrook's Masquerada and sired by Amanda Vanderbosh's legendary grey herdsire Bisturi (who is no longer in the country), Applause has the best of both! Bisturi's body style and lovely dense crimp style and Masquerada's fine, soft handle and strong color genetics. His body style is stout, big-boned, and solid. When he walks by, he makes a statement. He has a perfect bite and a head to die for. We cannot say enough about this young male to do him justice. At 8 years old, he still wows every visitor on our ranch! We could not be more pleased with the cria this male is producing. He is predominately throwing gray, even when bred to other color. 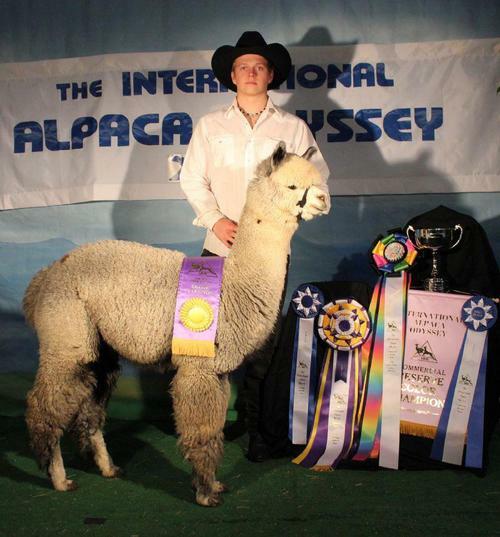 We are also excited about the rich, dark silver color we are getting, passed down from his dam!